We are excited to offer Invisalign®, an alternative to traditional metal braces, to the patients at our Calgary office. 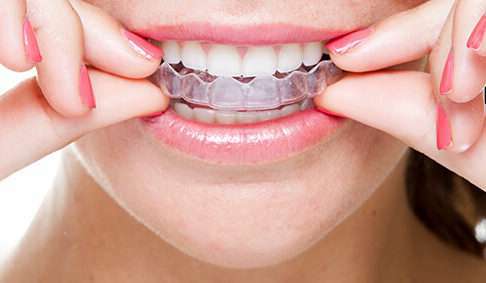 Invisalign uses removable plastic aligner trays to move and straighten without unsightly or uncomfortable metal braces. 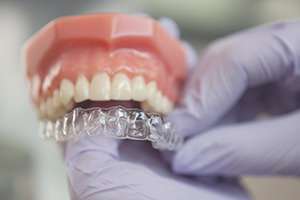 You don’t have to worry about brackets, glue or wires – just wear the smooth, clear plastic trays over your teeth and enjoy imperceptible orthodontic treatment! There’s no need to worry about the stress of food getting stuck in your braces or not being able to eat certain foods, because with Invisalign you’ll remove the aligners at mealtime. Being able to remove the aligners also means easier teeth cleaning and hygiene, and a lower risk of developing gum disease or the unattractive white spots that metal braces may cause. Finally, invisible braces save you time in your busy schedule with far fewer office appointments than one would need to maintain traditional braces. If you have more severe orthodontic issues, you may need regular braces and we will refer some patients out to an Orthodontist if that better suits your needs. Our qualified dentists will help you decide if “invisible braces” are right for you during your initial free consultation appointment. When you come in for your free consultation appointment with one of our Calgary Invisalign dentists, we will begin by discussing your goals for your smile. We will take digital x-rays, photos, and impressions of your teeth to determine if you are a good candidate for Invisalign treatment. If you are a good candidate, we will work with you to create a personalized treatment plan. Computer software will be used to create a 3D modeling simulation of your teeth as you progress through the treatment. This means you can see exactly what your teeth will look like before you embark on the full treatment plan. During this time, we will also determine the length of your treatment and the number of aligners you will need throughout the process. Then all of this information will be forwarded to the Invisalign lab where they will create your medical-grade plastic aligner trays. Every 6 weeks you’ll visit us to pick up the new sets you’ll need, and you’ll wear the trays all day, every day, except during mealtime or when cleaning your teeth. The aligner trays are computer-generated and extremely precise. They shift your teeth into place according to careful calculations and manufacturing. After your treatment is complete, we will create another specialized tray to use as a retainer while you sleep. The retainer tray is based on the alignment of your teeth on your last day of treatment once you have reached your ideal smile. To avoid softening and decreasing the effectiveness that tends to happen with traditional retainers over time, your Invisalign retainer will be replaced every four months. You may also be able to get a permanent wire retainer bonded behind your bottom teeth, and use an Invisalign retainer tray on your top teeth. Get a straighter smile with the clear solution to orthodontics. Book online or call our office at 403-252-7608 and schedule your free Invisalign consultation today.